James Lawley and Marian Way's new book explains how to facilitate people to solve personal and professional problems, generate ideas and access creativity. By creating multiple physical and mental perspectives that inform each other, a network of possibilities can emerge that has never been imagined before. Learn David Grove’s innovate Clean Space process and discover how to adapt it for any context, including with groups. Insights in Space: How to use Clean Space to solve problems, generate ideas and spark creativity is a powerful and practical example of both “Third Generation NLP” and “Generative Change.” It unites the three intelligences of cognitive understanding, somatic intuition, and field awareness into a seemingly simple yet deceptively sophisticated methodology to produce creative insights. The process integrates David Grove’s brilliant ‘Clean’ approach with the principles of spatial sorting to construct a type of generative ‘psychogeography’ from which new ideas and solutions can naturally emerge. The Clean Space approach helps to clarify, demystify and enrich some of the underlying dynamics—such as network effects, synchronicity and emergence—that make other spatial sorting methodologies work. My congratulations to James and Marian for this useful, clear and well-written book. A finely balanced degustation. This perfectly paced journey through Clean Space engages the senses as much by what is left off the menu, as by what is included. Practical, clearly written and illustrated, this book is invaluable for coaches, therapists, facilitators, innovation managers, creatives, strategists and anyone who is curious about the world of metaphors and symbols hidden in plain sight around them. Insights in Space is a phenomenal book that introduces the Clean Space process for change in personal and work environments. It has everything you need to deliver great Clean Space sessions. Clean Space is not a typical change process, but I assure you, people experience strong, “gut level” insight. Try it. You will not regret your choice made. And, if you work in organizations, this book can be your lifetime companion. Current Social Psychology, which includes Behavioral Economics, delights in pointing out how ‘irrationally rational’ we all are. One reason often given for this is all of us are stuck in a ‘situated perspective’ in everyday English, our own personal point-of-view. The conventional solution for this is to exchange our ‘inside view’ for an outside one – a switch from subject to observer. There are, in fact, many more options than that. In this book James Lawley and Marian Way guide you in how to naturally create multiple perspectives that inform each other and then become a new and emergent network of possibilities that were not even initially imagined. This book is a learning, practicing and teaching toolkit methodically organized in its presentation, selection of examples and sequence of increasingly customized processes. Being about ‘space’, it is gratifying to see it so clearly and effectively illustrated. Its beginning-to-end emphasis on applications will surely please its intended audience. Yet this does not illuminate the sophisticated communications insights that make them possible, so let’s do that here. The Clean Space process starts with ‘externalizing’ the explorer’s experience of their desired outcome or topic of interest. With this simple perceptual shift, the topic of interest is ‘in the world’ instead of ‘being the world’, thus overcoming a Behavioral Economics bias – the Illusion of Objectivity. Known in philosophy and developmental psychology as Naïve Realism, it is our ubiquitous inability to separate our ideas about the world from our perception of the world. Through this perspective shift, we can become clearer about the difference. Next, the explorer is invited to find another space. A change in space necessarily involves a physical perspective shift, and with it, a shift in mental space. This new and different physical and mental space might be the perspective of a younger or older self, or another person’s point-of-view (which may also be from another time) or something else entirely. These perspective shifts parallel how with our binocular vision we create depth perception. Our ability to see – physically and mentally – into situations is enhanced. When a third space is added, the usually invisible and significant influence of each space’s situation (context) becomes self-evident. Outside of our awareness, each situation frames the meaning of the thoughts, actions and emotions we have within it, and so sets limits on what we ‘see’. As additional spaces are added, the range of possible context perspectives multiplies and with them the potential possibilities. This is another major perspective shift. 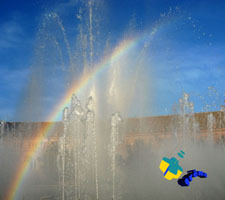 After exploring several spaces, the explorer is encouraged to establish links between these spaces. This is intentionally engaging a natural process. All of our experiences have their existing linkages – technically know as ‘reentrant circuits’. This is how we get from one thought to another, hold our memories together, have beliefs and so much more. The process of inviting links among the selected spaces serves these same purposes: vivifying their new and emergent meanings, creating cascades of new insights and securing their interconnections. Clean Space is a significant contribution to our understanding of how the language of everyday metaphors and mental spaces organize and impart meaning to our life experiences, showing us how to use them to effectively facilitate change in individuals, groups and organizations. Insights in Space: How to use Clean Space to solve problems, generate ideas and spark creativity is an excellent introduction to this work. 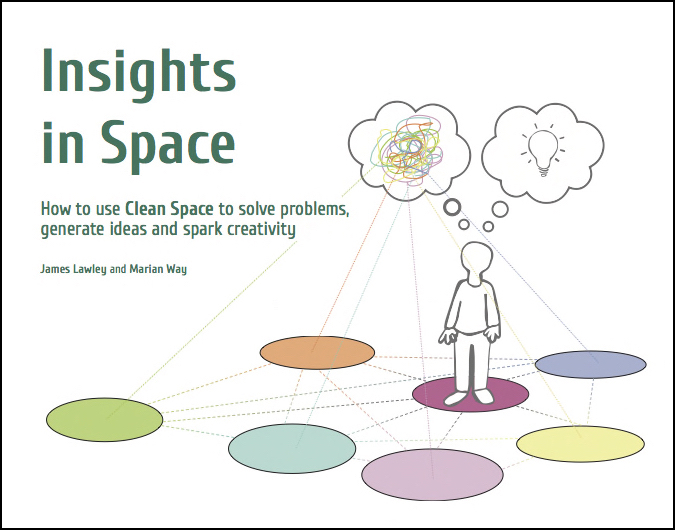 Authors of Insights in Space: How to use Clean Space to solve problems, generate ideas and spark creativity.